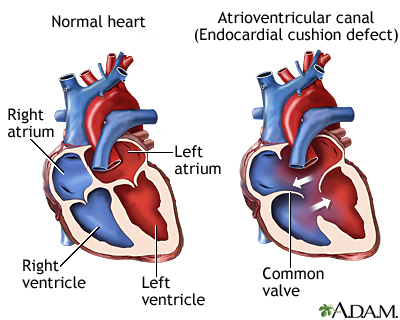 Endocardial cushion defect (ECD) is an abnormal heart condition. The walls separating all four chambers of the heart are poorly formed or absent. Also, the valves separating the upper and lower chambers of the heart have defects during formation. ECD is a congenital heart disease, which means it is present from birth. ECD occurs while a baby is still growing in the womb. The endocardial cushions are two thicker areas that develop into the walls (septum) that divide the four chambers of the heart. They also form the mitral and tricuspid valves. These are the valves that separate the atria (top collecting chambers) from the ventricles (bottom pumping chambers). Increased blood flow to the lungs. This results in increased pressure in the lungs. In ECD, blood flows through the abnormal openings from the left to the right side of the heart, then to the lungs. More blood flow into the lungs makes the blood pressure in the lungs rise. Heart failure. The extra effort needed to pump makes the heart work harder than normal. The heart muscle may enlarge and weaken. This can cause swelling in the baby, problems in breathing, and difficulty in feeding and growing. Cyanosis. As the blood pressure increases in the lungs, blood starts to flow from the right side of the heart to the left. The oxygen-poor blood mixes with the oxygen-rich blood. As a result, blood with less oxygen than usual is pumped out to the body. This causes cyanosis, or bluish skin. Complete ECD. 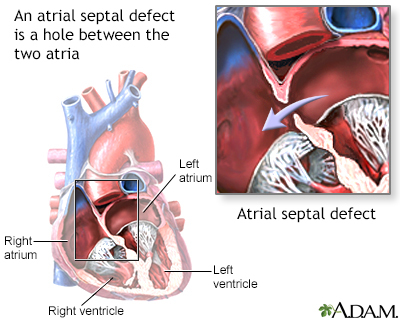 This condition involves an atrial septal defect (ASD) and a ventricular septal defect (VSD). People with a complete ECD have only one large heart valve (common AV valve) instead of two distinct valves (mitral and tricuspid). Partial (or incomplete) ECD. In this condition, only an ASD, or an ASD and VSD are present. There are two distinct valves, but one of them (the mitral valve) is often abnormal with an opening ("cleft") in it. This defect can leak blood back through the valve. ECD is strongly linked to Down syndrome. Several gene changes are also linked to ECD. However, the exact cause of ECD is unknown. Children with partial ECD may not have signs or symptoms of the disorder during childhood. Surgery is needed to close the holes between the heart chambers, and to create distinct tricuspid and mitral valves. The timing of the surgery depends on the child’s condition and the severity of the ECD. It can often be done when the baby is 3 to 6 months old. Correcting an ECD may require more than one surgery. Surgery for a complete ECD should be done in the baby’s first year of life. Otherwise, lung damage that may not be able to be reversed can occur. Babies with Down syndrome tend to develop lung disease earlier. Therefore, early surgery is very important for these babies. Many children live normal, active lives after ECD is corrected. Certain complications of ECD surgery may not appear until the child is an adult. These include heart rhythm problems and a leaky mitral valve. Children with ECD may be at risk for infection of the heart (endocarditis) before and after surgery. Ask your child’s doctor whether your child needs to take antibiotics before certain dental procedures. Also talk to the provider if your baby is not growing or gaining weight. ECD is linked with several genetic abnormalities. Couples with a family history of ECD may wish to seek genetic counseling before becoming pregnant. Ashwath R, Snyder CS. Congenital defects of the cardiovascular system. In: Martin RJ, Fanaroff AA, Walsh MC, eds. Fanaroff and Martin's Neonatal-Perinatal Medicine Diseases of the Fetus and Infant. 10th ed. Philadelphia, PA: Elsevier Saunders; 2015:chap 84. Backer CL, Mavroudis C. Atrioventricular canal defects. In: Mavroudis C, Backer C, eds. Pediatric Cardiac Surgery. 4th ed. Oxford, UK: Wiley-Blackwell; 2013;chap 18. Kliegman RM, Stanton BF, St. Geme JW, Schor NF. Acyanotic congenital heart disease: left-to-right shunt lesions . In: Kliegman RM, Stanton BF, St. Geme JW, Schor NF, eds. Nelson Textbook of Pediatrics. 20th ed. Philadelphia, PA: Elsevier; 2016:chap 426. 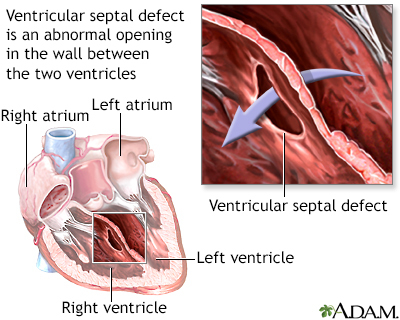 Ventricular septal defect is a congenital defect of the heart, that occurs as an abnormal opening in the wall that separates the right and left ventricles. Ventricular septal defect may also be associated with other heart defects. Many small defects will close on their own. For those defects that do not spontaneously close, the outcome is good with surgical repair. Endocardial cushion defect is an abnormal heart condition which occurs during the development of the baby. In this condition there is no separation between the chambers of the heart. Without the separation, oxygen-rich and oxygen-poor blood mix causing the heart to work harder. Endocardial cushion defect is strongly associated with several genetic abnormalities.